In 21st century America, stress is more prevalent and worst with each passing day. Simply said, we live in culture more stress-filled than ever before. Most adults have a tendency to try to ignore their stress or push it to the side. After all, society sometimes gives off the impression that stress is merely a fact of life, something to push through. While life no doubt comes with stressors, it’s important to learn how you best manage stress. Stress comes with a long list of effects on your life and health. What you might not have realized is how much stress can affect your wallet as well. Managing stress doesn’t come easy and for many their coping mechanisms only serve to cost them in the long run. 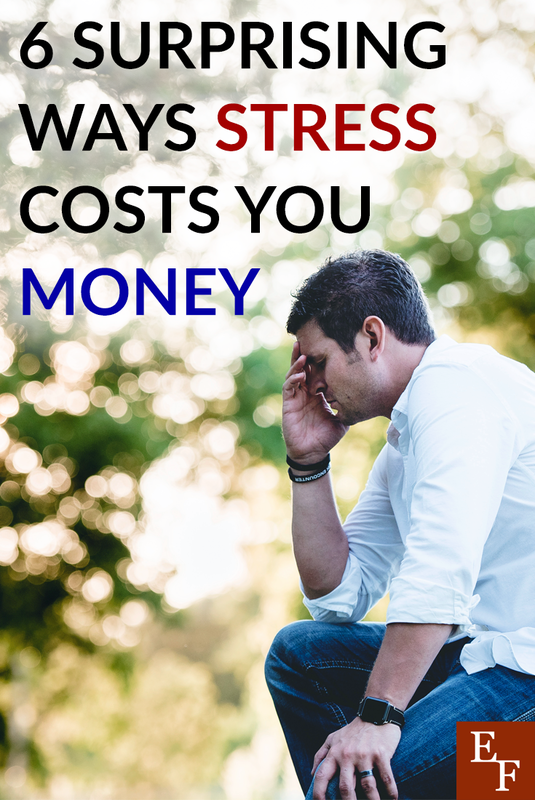 The best thing you can do is to be aware of the ways in which stress can cost you and find ways to prevent or lessen its impact in the future. Here are six ways stress and the way you cope with it could be costing you money. Increased stress has a way of breaking down your body and mind. Stress can serve as the gateway to other, more serious illnesses. It has the potential to lead to anxiety and depression, can cause added stress on your body, making you more susceptible to diseases and viruses, cause you to gain extra weight, and disrupt your sleep, in turn, leading to the aforementioned as well. Whatever the case might be, any harm stress causes to your body or mind will no doubt lead to a doctor visit of some sort, which could lead to further procedures or medications. Unfortunately, event the best of health insurances only covers so much, and you could end up paying out quite a bit in medical bills. Stress has a tendency to make even the mundane activities seem difficult and nearly impossible. After a long day of work, or if you’re simply dealing with other life stressors, the idea of cooking a meal can seem unappealing to say the least. That being the case, you might find yourself consistently going out to eat or grabbing takeout on the way home. While that’s fine every now and then, doing so on a regular basis only serves to cost you more than if you’d made a home-cooked meal. Moreover, even if you do stop at the store, you could find yourself opting for more convenience foods, which again, cost more in the long run. When it comes to most people, the instant gratification felt when purchasing an item is a feeling they can’t help but keep chasing. Ergo, when you’re stressed shopping can be a quick pick-me-up to turn to. Splurging every now and then to cheer yourself up is one thing, however, if you’re not careful, it’s an easy habit to get addicted to. It’s not called retail therapy for nothing, and after a while you might find yourself turning to the mall every time you’re coping with stress. Before you know it you’ll have bought one too many items and went way above your budget. Furthermore, thanks to the invention of online shopping, your shopping spree can turn into an all-day activity, costing you a fortune and possibly putting you into a bit of debt. It’s easy to lose your focus when you’re stressed. You become tired, your thoughts might become fuzzy, and your overall concentration could waver. All that to be said, keeping up with your day job and various other household and life tasks might feel like too much effort. Moreover, you could find yourself easily distracted away from said tasks if you work up the energy to do them. This decrease in productivity could show up in your job and home. You might find yourself lacking at your job which would no doubt lead to lost projects and, depending on how bad your productivity gets, could lead to a demotion or lost job even. Lost productivity also has the ability to affect other areas of your life. If you lack the productivity to take care of your home and other belongings you might end up paying extra in repairs, upkeep, or replacements. Vices are some of the first avenues people turn to when they’re stressed. Whether you smoke, gamble, or begin to turn to a nightly cocktail, in most cases, said habits are anything but cheap. That being said, the more stressed you are the more you’ll pick up and continue those habits. In no time at all nightly drinks, packs of cigarettes, lost bets will accumulate and take up a large portion of your budget. Sometimes finding ways to relax and destress is easier said than done. Spas, however, exist for this sole purpose. Hence, when you find yourself in a particular stressful time of life, you might find yourself taking regular trips to the salon. While massages, pedicures, and mud baths do have a tendency to do the trick, they also come at a steep price. One procedure every few months is a nice and affordable treat. Spending that money on a regular basis, however, could find you tight on funds. Stress is a part of life, however, too much of it can truly take its toll. Stress has a way of affecting your body and mind in ways you might not realize. It can cause health issues you might otherwise not have experienced. It might force you to turn to coping mechanisms that might not always be the best outlet for your stress. In turn, your stress could end up costing you and your money more than you know. Finding healthy and productive ways to manage your stress can help keep your healthy, mentally, bodily, and financially, in check and lead to a happier life. What are some healthy and inexpensive ways you’ve found to deal with stress?